A few weeks ago, the good folks over at HP sent me the Envy 100 e-All-in-One to test out. As a proud owner of the Envy Laptop, I am already familiar with the Envy line and can attest to the sleek designs and fashionable functionality of their products. This is the planet's first PVC-free printer so reduce your environmental impact, save energy and recycle your cartridges. Now we're really green with Envy! Enjoy the ease of printing with one-touch HP Print Apps that print straight from the web. Now you can access and print maps, movie tickets, coupons, recipes, greeting cards, Facebook photos and more. HP ePrint also lets you print from your smartphone, tablet or computer without installing any software. So whether you are printing in bed, from the front row of a fashion show or in another city - if you can email it, you can print it! We live in a multi-tasking world and HP has figured out that we want it all! So with just one tap on the high-resolution touchscreen, you'll be printing, copying and scanning in no time. Remember your dream vacation to Italy or want to remind your BFF what really happened at her bachelorette party? Preserve those memories for years to come by printing lab quality photos right in your own home. 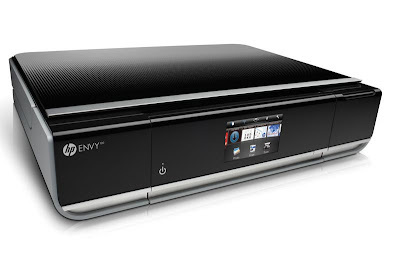 The HP Envy 100 e-All-in-One is HUG Approved!